Established on July 31, 2000, 1st Premier Home Care is a locally owned and operated home care agency that provides non-medical home care assistance to elderly persons in the comfort of their own homes. We believe that each client should experience high-quality, respectful and compassionate care. These values permeate every part of 1st Premier Home Care, from caregiver, through office operations, to our valued customers. Because we have provided care to our own aging parents and grandparents, we bring a sense of empathy, understanding and compassion when caring for your family. Our caregivers are carefully screened, trained and supervised to provide the highest quality caregiver services available in the greater Albuquerque area. 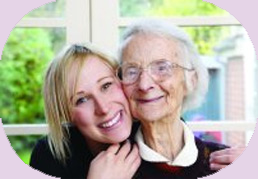 We provide additional training on Alzheimer's care, personal care assistance and safe transfer techniques to ensure sensitivity when providing home care assistance to clients with memory and mobility issues. Additionally, our home care agency has an A+ rating with the Better Business Bureau and is a leader in providing ethical and compassionate services to our customers. Please call us today at (505) 271-2120 or visit our Contact Us page. For assistance outside of normal business hours, please call our After Hours Department at (505) 321-5737. Copyright © 2019 1st Premier Home Care. Any use of the text and/or images on this site is strictly prohibited. Theme by Puro.